A police helicopter crashed into a crowded pub in Glasgow last night. At least three people are feared dead and 32 people have been taken to hospital. A band was playing inside the Clutha Vaults bar when the helicopter crashed into the roof just before 10.30pm. The police helicopter was reported to be carrying two police officers and a civilian when the accident happened. 120 people were reportedly in the pub at the time, and while many have thus far been rescued, others have been trapped by a partial collapse. Response times seem to have been excellent and the rescue operation is already being praised for its efficiency. A senior fire officer said they had made contact with some people trapped inside the pub but the building was unsafe and they were taking a "methodical" approach to the rescue. "I can confirm that it is a police helicopter which has been involved in the tragic accident in Glasgow. Rescue efforts in full operation. Given an incident of this scale we must all prepare ourselves for the likelihood of fatalities." A spokesman for Police Scotland said: "A major incident has been declared after the Eurocopter EC135 T2 – with a crew of three consisting of two police officers and a civilian pilot – came down on the roof of a pub in Stockwell Street at 10.25pm. "Emergency services responded immediately and remain at the scene at the present time. 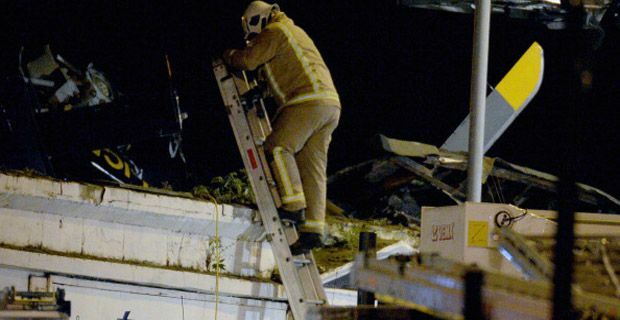 Cordons have been put in place to allow the rescue operation to take place." Assistant Chief Officer Lewis Ramsay of the Scottish Fire and Rescue Service said "We have dealt with numerous casualties ranging from walking wounded to people who have had to be assisted from the scene. Some have been treated at local hospitals. We are unable to confirm numbers at the moment. "We have a crew in place working to stabilise the building and we've called on resources and colleagues from across Scotland including Dundee, Edinburgh and Falkirk. We have around 125 firefighters on the scene in total." "That rescue operation is clearly ongoing. It is too early at this stage to provide any details around why the helicopter came down.